The invitation appeared one Sunday in Joanna Chase's church bulletin: Come to a "faith forum" and join a conversation about the intersection of religion and politics. Living in New Hampshire, Chase is accustomed to pitches from presidential hopefuls, especially those focusing on values-voting Republicans. But this one came from the team of a Democrat, Sen. Barack Obama. The candidate himself wasn't on the bill. But about 50 people showed up to talk about the war, poverty and trying to seize back the moral mantle some in the GOP claim. The night also featured an Obama video and a campaign altar call - an invitation to become a "congregation contact" and rally support for the candidate. "I don't know if I will vote for Barack Obama," said Chase, 62, who was inspired enough to organize a similar forum at her United Church of Christ congregation in Northwood, N.H. "There are several candidates I like very much. But I love that he has the character and confidence to allow people to do this. He doesn't have to own every bit of it." The leading Democratic contenders for the White House all have made a point of talking about religion this campaign season. They discuss their faith journeys and how their beliefs influence their policies. The campaigns of Obama, Hillary Rodham Clinton and John Edwards all are doing outreach to religious communities. But Obama, the junior senator from Illinois, has made religion a signature part of his campaign through his own public appearances in places where Democrats rarely venture, and a faith-based voter mobilization, topped by forums in Iowa, New Hampshire and South Carolina that could prove key to organizing. "I don't think a Democratic presidential candidate has come close to doing anything like this before," said Mark Silk, director of the Leonard E. Greenberg Center for the Study of Religion in Public Life at Trinity College in Hartford, Conn. "If you are going to parse the different dimensions of how a presidential candidate does religion, he's doing them all." Will it win votes? Create a backlash from Democrats angry that religion and politics are too intertwined? 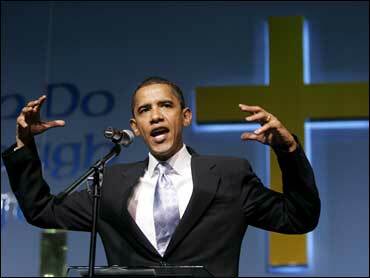 Obama has drawn criticism from the Rev. Welton Gaddy of the liberal Interfaith Alliance, who said the senator "has sounded precisely like George W. Bush" in recent church appearances. A member of the liberal United Church of Christ, Obama has said he was raised in a nonreligious home and had a conversion experience after doing community organizing in Chicago churches. He spoke last year - before announcing his candidacy - of a desire to tackle "mutual suspicion" between religious and secular America. He invokes biblical imagery, saying that because government alone cannot solve problems, "we have an individual responsibility to be our brother's keeper and our sister's keeper." At the same time, Obama has lauded the separation of church and state and has paid homage to America's religious pluralism. Campaigning in Iowa over the weekend, Obama framed the climate change debate in religious terms, saying: "We are not acting as good stewards of God's earth when our bottom line puts the size of our profits before the future of our planet." Obama's religious affairs director, Joshua DuBois, said his charge is to create a "robust, grass-roots outreach program" - including nonreligious people who view issues through a moral lens and want a voice in the debate. DuBois is a former Obama Senate aide and former associate minister with the Assemblies of God, a Pentecostal denomination. The faith forums, like the one Chase attended in New Hampshire, are perhaps the most visible illustration of the Obama faith ground game. More than 25 were staged in Iowa and New Hampshire. The campaign is now in the midst of a "40 Days of Faith and Family" drive of forums, gospel concerts and candidate appearances in South Carolina, where Obama is lagging behind Clinton in polls and fighting the former first lady for the state's black vote. At a recent forum at a public library in Myrtle Beach, S.C., 58-year-old Vietnam veteran Bennie Swans walked in "lukewarm" about the Obama campaign, supportive of Obama's opposition to the Iraq War but otherwise unsure. Swans said he walked out invigorated by what he saw: "People coming together from various points of life, ages and races, working collectively on issues of faith and politics. Our churches are so segregated. You usually don't see that." The Mount Olive AME Church member signed on as a "congregation contact." DuBois said the campaign is clear that political organizing cannot take place within houses of worship, which would land them in trouble with the Internal Revenue Service. The goal is to reach friends and family, some of them church members, he said. Beyond the forums, the campaign stages a weekly interfaith prayer conference call, runs a "People of Faith for Barack" Web site and has a page on FaithBase.com, a social networking site modeled on Facebook and MySpace. Traditionally, Democratic religious outreach has meant mobilizing support in black churches and bastions of liberal mainline Protestantism. Obama has done those things, but he's also taken part in a summit on AIDS hosted by evangelical mega-pastor Rick Warren and appeared at Southern Baptist churches in South Carolina. At an evangelical church in Greenville, S.C., Obama said he seeks to be an "instrument of God" and expressed confidence "we can create a kingdom right here on Earth." That prompted Gaddy, of the Interfaith Alliance, to criticize the candidate in a conference call with reporters. Gaddy cautioned against any presidential candidate talking about building such a kingdom while "in an evangelical church in which that terminology has a very specific, indisputable definition that is exclusive rather than inclusive." Obama's own church background could cause problems as well. His Chicago pastor and spiritual mentor, the Rev. Jeremiah Wright, emphasizes "black values" in a church message that has stirred controversy. Polling data suggest religion may help Obama set himself apart from Clinton, the front-runner. A poll last month from the Pew Forum on Religion and Public Life found 84 percent of Americans considered Obama very or somewhat religious, compared with 69 percent for Clinton, a Methodist. Edwards, also a Methodist, had numbers comparable to Obama's and was more likely to be considered "very" religious. Clinton has cited the influence of Methodism's social gospel and has hired Democratic strategist Burns Strider, a Southern Baptist, to direct her religious outreach. Edwards has stressed how his faith shaped his desire to combat poverty. Mara Vanderslice, a Democratic consultant on religious issues, said it's striking that Democrats are engaging religious voters in the primary season after virtually ignoring them in 2004. "That will solidify the involvement of the religious community in Democratic campaigns going into the general (election)," she said. "But it will also change the culture. This will become part of what we do."